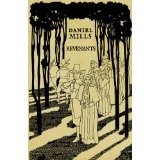 Revenants by Daniel Mills is a fascinating novel. Pre-colonial New England is the backdrop for this rich and moody tale. Personally being from Massachusetts and having read more than a bit of Hawthorne and other classic New England authors, I would have to say Mills captures the feeling of these early American novels. His work is an obvious tip of the hat to Hawthorne and is done well. The members of the isolated town of Cold Marsh have cut a home out of the stark lonely forest after following their minster Bellringer into the wilds. Life has never been easy for the small town's inhabitants. Just a generation ago, they were forced to commit genocide with the Native American tribe that had once been their friends and allies. Most of the town's men were hiding from dark pasts, even before this horrible massacre and a shadow of dread hangs over Cold Marsh and lurks in the forest which surrounds the small patch of humanity. The clinging fear the village suffers from only increases when some of their young women go missing. One is found drowned, while another has just seemed to have vanished within the endless forest. When young Ruth, the girl promised to marry Edwin, disappears the town has experienced enough and mobilizes to find her. Despite the small hope of success and the inherent dangers of the encroaching woods, three teams of men set off to find the missing girl. The groups are led by Ruth's father, James, Edwin, and Edwin's father William. Each of these men must confront not only the outer forest, but their tangled inner forest as well. William is a forthright and strong man, but has seen the horror of war and knows that his actions in these past conflicts have left a dark mark on his soul. James is barely keeping his sanity intact after the loss of his only child and is willing to go to any lengths to insure her return, even if it means making an alliance with the dark forces that have claimed her. Edwin learns more that he might have wished about the sins of his father when a lone and mutilated native is discovered. Each of these men must battle themselves as much as the harsh environment they have plunged into while they seek poor lost Ruth. The hopelessness of their task mixes with the hopelessness of their chances at redemption. Soon violence and insanity may end up being the only ones victorious. Mills paints an ominous picture of pre-American New England. He seeks to capture the feel of our country's earliest writers and pulls it off with great skill. It is a bleak time, without much light and limited choices for those that struggle to survive on the threatening new continent. The stark realities of puritan living are illustrated well, along with the superstitious fears that cursed those times. This is a fine and enjoyable novel, but if one had to find criticisms they could include a few places were the book had gaps that left the reader wondering what really happened. Others parts, although well written, were predictable. Overall this is a fine novel that would be enjoyable to both fans of horror and historical fiction readers alike. Mills sets off to perform the difficult task of writing in the style of authors that lived centuries ago and succeeds. I look forward to getting a copy of his next project.